Popover Pie, with Ham, Peas, Cheese, Thyme for Cooking easy main course. 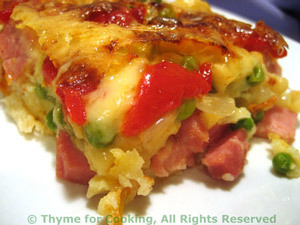 This is a colorful pie, with the bright green peas and red pimento. I sautéed the filling briefly - to tenderize the onion and defrost the peas. Cut ham in to strips or small cubes. Heat 2 tsp olive oil in medium nonstick skillet over medium-high heat. Add onion, ham and sauté until onion is tender. Add peas and heat through. Remove from heat and set aside. Open and drain pimento or red pepper. Cut into strips. In medium bowl lightly beat eggs with wire whisk. Add milk, flour, salt and nutmeg. Beat lightly to just combine; a few lumps are okay - over-beating is not. Put remaining 2 tsp olive oil in 10-inch glass baking dish and run it around to coat the bottom. Pour in the batter mixture. Spoon ham and peas onto the batter to within 1 inch of sides of dish. 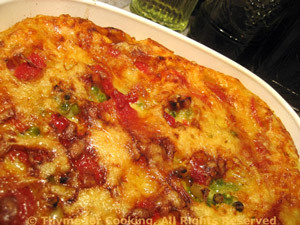 Lay the pimento strips across the top and sprinkle with cheese. Bake at 425F (215C) for 30 minutes or until edges puff up and are golden brown. Remove and let rest a minute or 2. Cut into wedges and serve.